The massive peninsula of Flamborough is situated on the East coast of Yorkshire, and forms one of the most impressive landscapes of this stretch of coastline. The sights alongside this walk promise to be well worth visiting. Flamborough is a village and civil parish in the East Riding of Yorkshire, England. It is situated approximately 4 miles (6.4 km) north east of Bridlington town centre on the prominent coastal feature of Flamborough Head. The most prominent man-made feature of the area is Flamborough lighthouse. The headland extends into the North Sea by approximately 6 miles (9.7 km). To the north, the chalk cliffs stand at up to 400 feet (120 m) high. 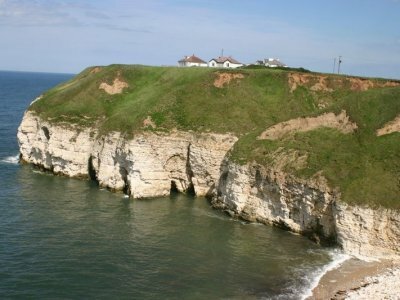 Flamborough is very popular as a holiday destination during the summer months due to its holiday camps, such as Thornwick and Sea Farm Holiday Centre, and Greenacres Caravan Park. The church of St Oswald stands in the village, and the village centre contains as number of interesting shops and pubs. The Old Dog and Duck is at Dog and Duck square, opposite the now defunct shop previously known as the "Patisserie Belge" which in fact sold a wide variety of goods other than those normally found in a "Patisserie".